Traverse party about to leave station. Photo by Chris Wilson. Photos taken by current ANARE expeditioners ‘down south’. A new selection of photos will be hung every three -four months. Balloon release by Met Team. Photo by Chris Wilson. External view Biscoe Hut. Photo by Chris Wilson. Inside Biscoe Hut. Photo by Chris Wilson. Rumdoodle Hut. Photo by Chris Wilson. Hendo Hut. Photo by Chris Wilson. Rafted sea ice. Photo by Chris Wilson. Fang Hut with Hagglunds. Photo by Chris Wilson. View of setting sun from Wharf Hut. Photo by Chris Wilson. View of setting sun between Emergency vehicle shed (on left) and Red shed accomodation block. Photo by Chris Wilson. 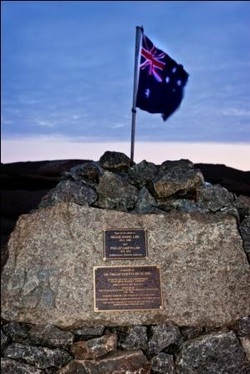 Mawson with moon rising. Photo by Chris Wilson. Graves on West Arm, Mawson. Photo by Chris Wilson. The graves of the 3 men who died at Mawson, Robert White (1963), Ken Wilson (1972) and Geoff Cameron (1974) are on West Arm looking across to Mawson. They are very much a part of Mawson - the simple yet elegant white crosses visible against the rock of West Arm whenever you gaze out across the harbour. Phil Law's cairn has been built adjacent to these graves. Graves on West Arm. Mawson station in distance. Photo by Chris Wilson. Noctolucent clouds over Mawso. Photo by Chris Wilson. 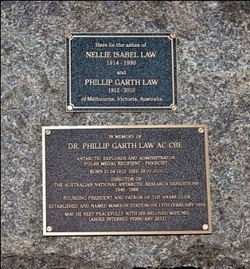 Detail of the plaques on the Phil Law cairn. Photo by Chris Wilson. Icebergs and penguins near sea ice at Mawson. Photo by Chris Wilson. The half finished water storage tank. Photo by Chris Wilson. Red shed in sunrise glow. Photo by Chris Wilson. The DH7 clearing snow around Mawson. Photo by Chris Wilson. Rosella in the snow. Photo by Chris Wilson. Aurora over Colbeck Hut and Hagglunds. Photo by Chris Wilson. 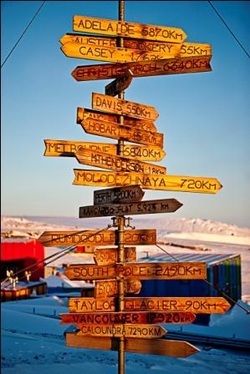 Can anybody tell us when this was erected, and when the various direction signs were added? Old aircraft hanger building in the snow. Photo by Chris Wilson. View of station. Photo by Chris Wilson. Aurora over site services. Photo by Chris Wilson. Sea ice drilling near Low Tongue. Photo by Chris Wilson. Football tipping box found in old station accomodation. Photo by Chris Wilson.